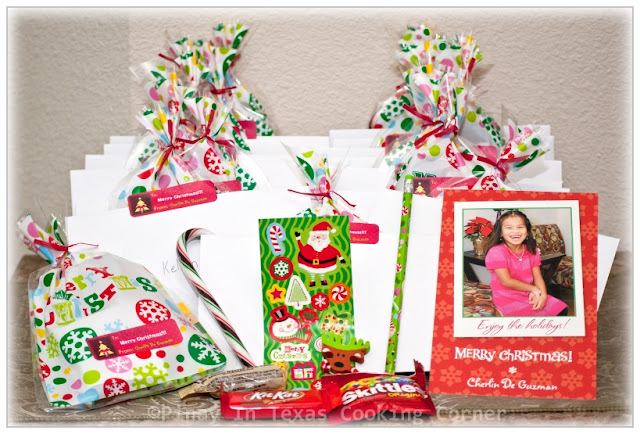 Every year since Clarise started school, she's giving her classmates and friends store bought Christmas treats like these (which Cherlin gave to her classmates). But this year, she requested for something different. I guess she's now in that stage when she wants to make Christmas more personal. She said she prefers something homemade this year...something that she can help make. 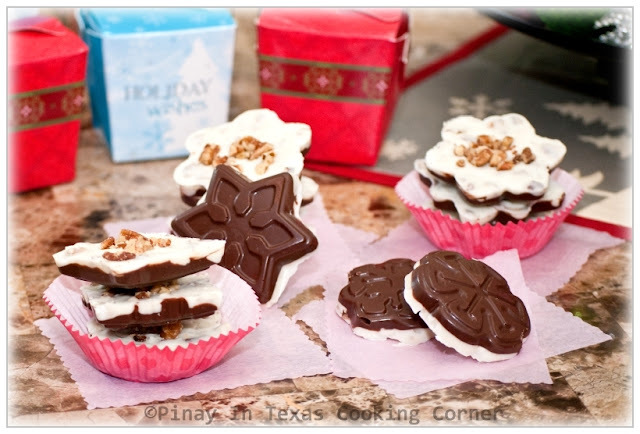 She wanted to make Christmas treats with her favorite pecan and chocolates in it and she first thought of making mini chocolate pecan cupcakes. 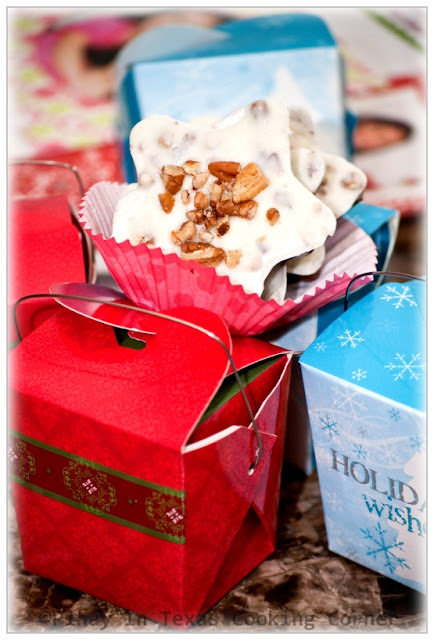 But when I showed her Lizzy's Snowflakes Peppermint Bark and told her that we can replace the peppermint with pecans, she was thrilled! 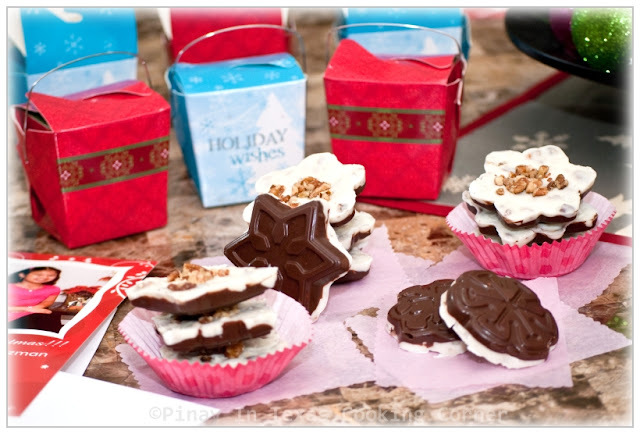 Using the Wilton Snowflakes Cookie Pan that I found on sale at Michael's last week, we came up with these cute Snowflakes Pecan Bark. We put them in mini Chinese takeout boxes which we got from Dollar Tree. They're so cute, aren't they??? And the best thing is they are so easy to prepare! If you are still thinking of what edible gifts to make...this is the answer! Clarise's classmates loved them! If you want something with peppermint, check out Lizzy's Snowflakes Peppermint Bark...I made some, and they are really great! 2. 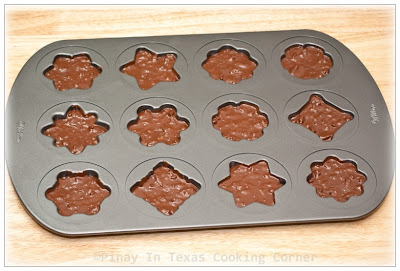 Place semi-sweet chocolate morsels in a microwave-safe bowl. Microwave for 30 seconds then stir. Continue melting in the microwave in 15 second increments, stirring after each heating, until chips are melted and smooth when stirred. Add 1/4 cup chopped pecans. Mix well. Pour onto prepared mold. Spread to about 1/4 inch thickness. Gently tap mold on a flat surface to even out thickness. Set aside. 3. 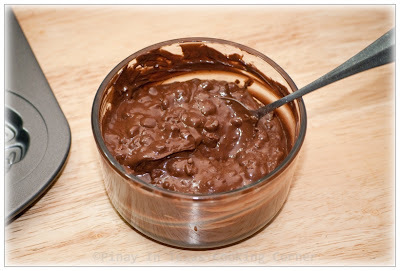 Place semi-sweet chocolate morsels in a microwave-safe bowl. Microwave for 30 seconds then stir. Continue melting in the microwave in 15 second increments, stirring after each heating, until chips are melted and smooth when stirred. Add the other 1/4 cup chopped pecans. Mix well. Pour over the brown chocolate. Spread to about one 1/4 inch thickness. Gently tap mold on a flat surface to even out thickness. 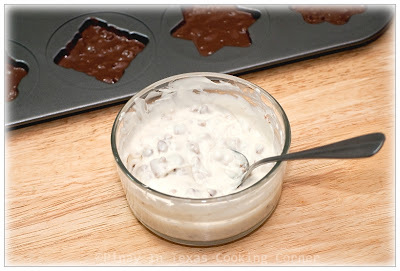 Sprinkle remaining pecan pieces on top. 4. Refrigerate about 30 minutes or until firm. To release chocolate from mold, cover a flat surface with a paper towel. 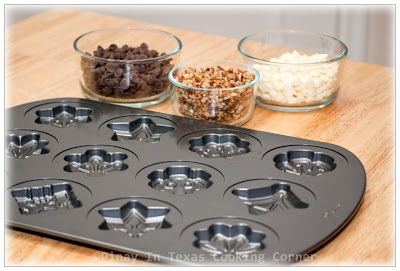 Hold mold upright; lightly tap edge on the flat surface until chocolate starts to release. 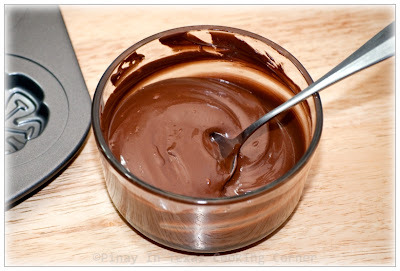 If necessary, insert thin blade of paring knife between edge of chocolate and mold to release chocolate. Store in cool, dry place. This is a wonderful reminder about that pan-I have been seeing a lot of candy bark variations out there lately and the forms make for such an awesome presentation. 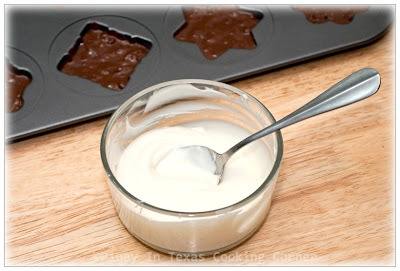 Even with all the variations-your chocolate pecan is not one to miss-yum! i am sure Clarise's classmates will be discussing these treats for quite some time. Great pictures! Beautiful, Tina!!! Those came out perfect!!! Have a Happy Holidays! WOW! So pretty and yummy at the same time. I love that pan! YUM YUM. I knew I should have bought those cool pans at Michaels! Maybe they'll be on sale after Christmas. 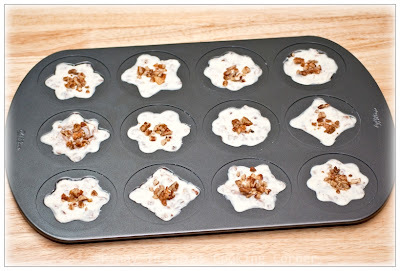 Great idea about the pecans! Delicious Tina, good gift idea. Wonderful home made goodies Tina and salute to your daughter for the suggestion of making these. The packaging makes it all the more attractive. These are so beautiful treats for the chicldren and also such a gentle gesture on behalf of your daughter's! Merry Christmas to you and your family, Tina! What a great idea to use the takeout boxes for your gifting! Fun post!